What Is Washing Soda and How Is It Used? If you are researching DIY laundry detergents, one of the most common ingredients is washing soda. Is that the same thing as baking soda? Where can you find it? Let's take a look at washing soda and the role it can play in cleaning laundry and tackling other household chores. The chemical formula for washing soda is Na2CO3 or sodium carbonate. It is a salt of carbonic acid, a chemical which produces a wide range of salts collectively known as carbonates. One common source of washing soda is the ashes of burned plants; for this reason, it is sometimes called soda ash. The sodium carbonate "softens" water helping other cleaning ingredients lift soil from the fabrics and suspend the soil in the wash water. The washing soda binds to the minerals which make water hard and allows the detergent to be absorbed into fibers properly to clean clothes. Washing soda should not be confused with baking soda, although the two compounds are closely related. What Are the Uses of Washing Soda? In the laundry room, the high alkalinity of washing soda allows it to act as a solvent in removing a wide range of stains. For home laundry, washing soda can be dissolved in water to create a presoaking solution for tough stains like grease, blood, tea, and coffee stains. Outside the laundry room, sodium carbonate is also used by some textile artists to help dyes adhere to fabric. This is particularly useful when creating natural dyes from plants. 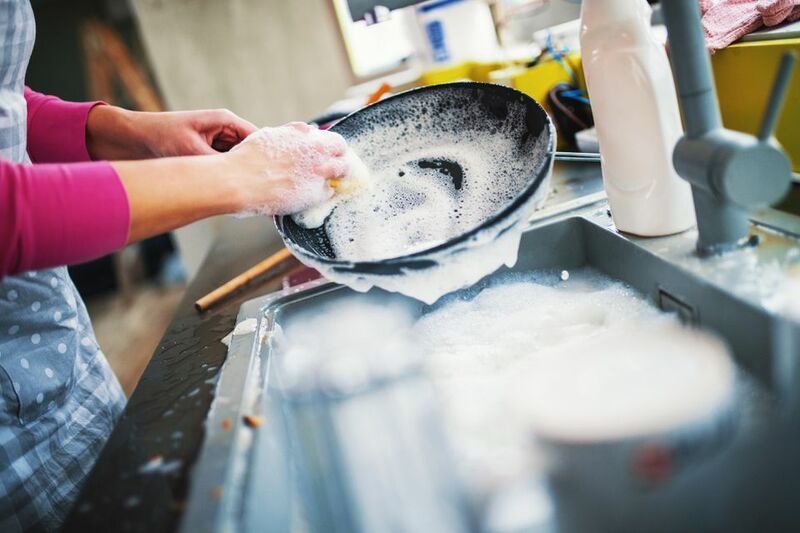 Washing soda can be used to remove greasy build-up from pots and pans, oven racks, and drip pans. It is very good for removing coffee and tea stains from ceramics and plastic storage containers. It can even be used in bathrooms to remove soap scum and around the house for general cleaning of hard surfaces. For cleaning, mix a solution of 1/2 cup of washing soda to one gallon of warm water. To unclog drains, pour one cup of washing soda into the clogged drain followed by two or three cups of boiling water. Allow the washing soda to work for 30 minutes and then flush the drain well with plain water. Repeat as needed. In the garden, washing soda works well to clean outdoor furniture and decks. It can also be mixed (1/2 cup to two gallons of water) to create a spray to help control aphids, whiteflies, and black spot on roses. Since sodium carbonate can be dangerous in large quantities, make sure to keep washing soda out of the reach of children and pets. You should wear gloves when cleaning with washing soda because it can cause skin irritation. It can be harmful to the eyes, cause irritation to the lungs if inhaled, and may cause abdominal pain or vomiting if large doses are swallowed. In the United States, most washing soda is sold under the Arm & Hammer brand, manufactured by Church and Dwight. If you can't find it locally, washing soda is readily available online. If you cannot find washing soda in your area and don't want to place an online order, you can make your own by slowly heating baking soda. Baking soda (sodium bicarbonate NaHCO3) is plentiful and inexpensive. By heating baking soda you will release the carbon dioxide and water molecules, leaving you with dry sodium carbonate or washing soda. Place about two cups of baking soda in a shallow baking dish or on a shallow baking sheet. Working in smaller quantities is easier to monitor and control. Place the dish in a 400 F oven for one hour. Stir the baking soda and smooth back out to an even layer. Bake an additional hour at 400 F.
Allow the baking soda (now washing soda) to cool completely. It will look more yellow and be much more coarse in texture. Label the container and store out of reach of children and pets.